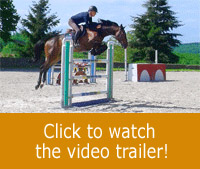 This exercise will teach the horse to lift his knees and shoulders faster to jump better. 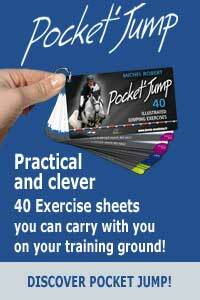 This exercise is designed to improve the horse’s responsiveness and style over grids especially after a larger fence type such as a water jump or an oxer which prompts the horse to get flat and rush. The rider has to let the horse take the responsibility of finding the solution to jump in the best conditions. Michel shows us the exercise riding Undiams, an 8 year old gelding who is really willing to jump but who also has a tendency to rush fences. The idea is that the rider should interfere with the horse as little as possible to let him find the solution. On the way-in to the grid, the rider has to move his hands forward during the take-off stride and keep his horse on a straight line while following the movement over fences. Under no circumstances, should the rider use his legs and hands aids like most riders are used to do, thinking it will help the horse. On the contrary, the horse needs his complete freedom of movement to learn to settle over combinations, pick-up his shoulders, use his back over fences and yet improve his front end speed of reaction. rides in the grass paddock with log fences. You can also practise it with some show jumping fences. The bank can be replaced by an oxer, a water jump or even a Liverpool….The height of fences should be adapted to the level of the horse and rider.